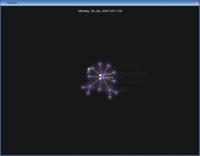 Description: 3D visualisation tool for source control reps. I have tested it with the CVS log from the LAME project. Also, make sure you install libpcre before running the app. That should be all, have fun! OpenGL-based 3D visualisation tool for source control repositories. the video mode to this also. Begin at some position in the log (between 0.0 and 1.0). Stop on break in activity. May be combined with --stop-position. Skip to next entry if nothing happens for a number of seconds. Time in seconds files remain idle before they are removed. Specify format of the log being read (git,cvs,hg,bzr,custom). Print the git log command used by gource. Print the hg log (Mercurial) command used by gource. Print the bzr log (Bazaar) command used by gource. Print the cvs-exp.pl log command used by gource. (eg 'Full Name.png') to use as avatars. Path of .jpg or .png to use as the default user image. Set the maximum number of files. Excess files will be discarded. Max time files of a commit can take to appear. Time users come to a complete hault. Separate multiple elements with commas. Write frames as PPM to a file ('-' for STDOUT). Framerate of output (used with --output-ppm-stream). older version (changing %aN to %an for instance). type      - initial for the update type - (A)dded, (M)odified or (D)eleted. may use the mouse to inspect the detail of individual files and users. be toggled using the Middle mouse button. mouse button rotates the view. (N)   Jump forward in time to next log entry.